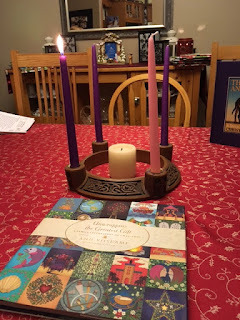 When I was a child, it was always very confusing (and felt very unfair at the time) that while Advent started on a Sunday at church, the calendars we had only began on December 1st. We decorated our house for Christmas, except for the tree which went up just before Christmas Eve on the 22nd or 23rd and we started to sing the Advent hymns like O Come, O Come Emmanuel (my favourite), Hail to the Lord's Annointed and on Jordan's Bank and my mom always gave us a small gift. Then, there would be this gap because the Advent calendar didn't start until the first and the gap seemed so unfair. We were never lucky enough to have chocolate calendars - my mom always went to the Anglican Book Centre and bought us one with a nativity scene on it but we were always very excited to open the door each evening. We usually put the calendar on the mantel or hung it up in front of the fireplace and it had a place of prominence until Christmas arrived. It was a small tradition but one that was critical for us. Today was the day that we began opening doors this year and everyone was rather excited. Dh got each of the kids a Lego Advent calendar, living his childhood through the kids and I have a David's Tea one that was a gift from my mom. We set a rule, though, that family devotions have to happen before any doors get opened and nobody seems to mind. This year, we are using "Unwrapping the Gift" by Ann Voskamp, based on her Jesse Tree materials that she has had linked on her blog for several years. Often, devotions are a time when my expectations of a meaningful and uniting family time dissolve into my helpless rage and the lack of cooperation from my family - the kids arguing or obsessing over the door they will open, Dh trying (not so hard) to pretend to be interested and me having unfair expectations of it all. Thankfully, tonight wasn't that way, it was quite lovely. First, we opened our book gift (that's another post), then we had a discussion about Jesse' stump. I was pretty shocked when LB immediately piped up that Jesse was "the boy's father who gave him the beautiful coat and his brother's wanted it so they threw him in a ditch and told their dad that he got murdered." Definitely a point to AWANA at our church because, while I do read the Bible with the kids, I don't expect that level of memory! Anyway, we discussed the stump and how God can use things that seem dead and then, after reading Ann Voskamp's little meditation, we worked through a few of the questions. I found it really interesting that when the kids were asked who needed God's love right now, they both instantly were able to name a child in their sphere who was struggling and we talked about how to help that child and how they could support that child to be less lonely. We finished by praying for those kids. 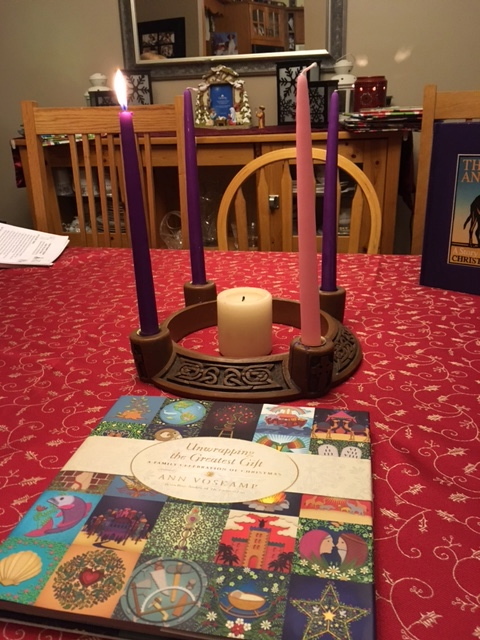 One of the areas of focus in the book is that Advent is a time for us to look for God's love in the small, in the insignificant, in the lonely and in the lesser. That is one thing I would like our family to reflect on this season. How can we help God's Kingdom come on Earth through our little daily actions.